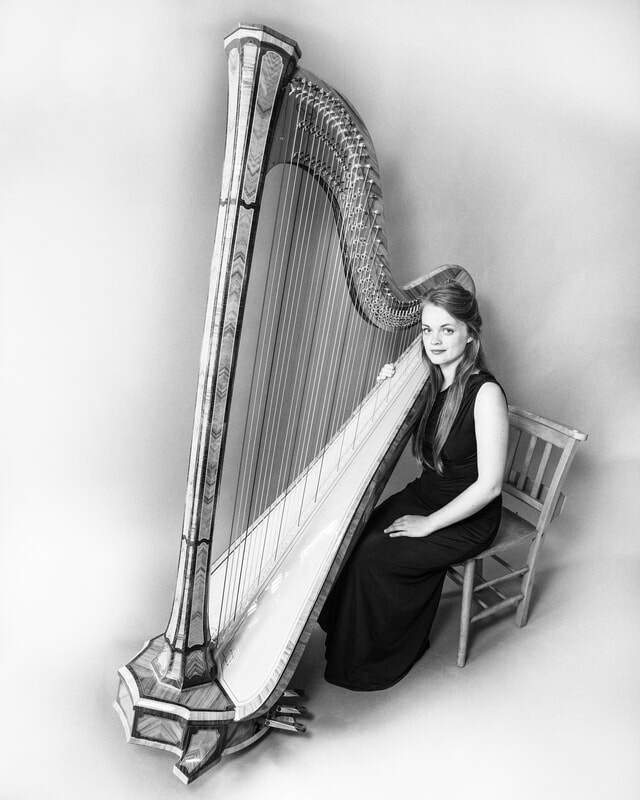 UK Harpist Alice Kirwan is best known for her dynamic and adventurous exploration of the harp. Since graduating with a Masters in performance from the Royal Northern College of Music, she regularly works with many orchestras and ensembles including the National Symphony Orchestra, Cantata Dramatica and Rydale Festival Orchestra. She has also worked with numerous artists such as Alfie Boe, Joe Duddell, and Palace. An avid performer of contemporary repertoire, Alice is passionate about showing the versatility of the harp to new audiences. She has appeared across the country presenting exciting and unique solo programmes. Recently, Alice has been involved in the cross genre collaboration “Pages From My Songbook”, a multidisciplinary theatre project at the Royal Exchange Theatre, as well as performing with the contemporary group Apartment House at Yorkshire Sculpture Park. Alice also has a wealth of experience performing at weddings and events; she performs at venues across the UK and has a vast repertoire to suit all musical tastes. In addition to performing, Alice is passionate about teaching the harp to all ages and abilities. 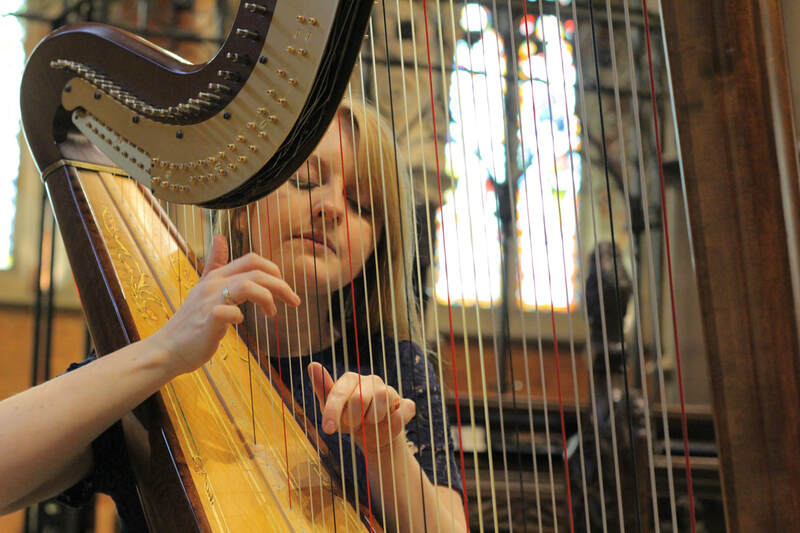 Having previously taught at Repton School for three years, Alice is now visiting harp teacher at both Manchester High School for Girls and The Manchester Grammar School. Through her work at The Early Music Shop, Saltaire, Alice provides one to one monthly lessons as well as workshops and 'Come and Try' sessions at the annual Saltaire Camac Harp Festival. Lucy Nolan began studying the harp at the age of seven with Eira Lynn Jones. After graduating from Oxford University in 2013 with a BA in Music, she returned to study for a Masters in Performance in which she achieved a Distinction. During her time at Oxford University she was awarded the Margaret Irene Seymour Award, the Archibald Jackson Prize for outstanding postgraduate results and an Alice Horsman Scholarship as well as the Oxford Philomusica Young Artists’ platform for her performance with flautist, Aimee Taylor. Lucy is passionate about helping to develop new music for the harp. As a keen performer of contemporary music she was part of an ensemble of 20 harps who performed at Huddersfield Contemporary Music Festival and was invited to play in the first performance of a work for harp, flute and viola by Peter Reynolds. She worked closely with the composer Paul Patterson, to prepare his work, Armistice, for a performance in July for the World Harp Congress in Hong Kong and she recently gave the European premiere of his harp duet, ‘Scorpions’ as part of the Chroma Harp Duo, a piece for which the duo was awarded first prize in the ensemble class at the Camac Harp Competition in London and the UKHA prize for the best performance of a work by a British composer. She was also selected to work with the Norwegian composer, Eyvind Gulbrandsen, as part of a Moving Classics project which culminated in the premiere of a new piece at the Hull City of Culture Festival this year. Lucy enjoys performing a wide range of music and recent projects include a concert as part of a contemporary Indian duo at an event for the Archbishop of Canterbury at Lambeth Palace, a programme of Mahler’s songs with Ian Bostridge, Handel’s Harp Concerto in B-flat Op.4 with New Chamber Opera and a production of Stephen Sondheim’s musical, A Little Night Music, at the Oxford Playhouse. As well as performing regularly as a soloist, Lucy is also a keen orchestral player and has worked with conductors such as Sir Mark Elder and Gabor Takacs Nagy as well as with the Piccadilly Symphony Orchestra, Philomusica of Aberystwyth, Amadeus Orchestra, Halle Youth Orchestra, Oxford University Orchestra, Oxford Chamber Orchestra and Ensemble ISIS. She was recently selected to go on tour with the European Union Youth Wind Orchestra in Luxembourg, Germany and the Netherlands. Available for events in: Cheshire, Derbyshire, ​Lancashire, Nottinghamshire and Yorkshire.